Odana Falls (大棚の滝) is a waterfalls located on Ashitaka mountains. It is 21m high and in autumn, it has beautiful autumn leaves. In Spring, Tsutsuji flowers bloom around this waterfalls. In Summer, it has great green leaves. In Fall, there are many autumn leaves. In Winter, ice covers the falls. 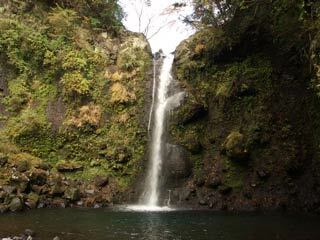 This waterfalls is located on the entrance of hiking course of Ashitaka mountains.